Love the art and tunes. Played and rated. Nice work! WOW That is a lot of art to be made by a single person! I really hate the new gamejolt interface. The game is fun and also the music, although i am missing some kind of foe who tries to stop me. I don't like it either. Urgh. You're the monster and everyone knows that if they tried to stop you they'd get rolled and destroyed. I really like this, its like Bloodborne but you removed all the bits I didn't like. You did it again! What an entry. "The amount of art created was impressive for the time frame. I enjoyed the game, I thought it was fun, but I felt like it lacked point and was too long. 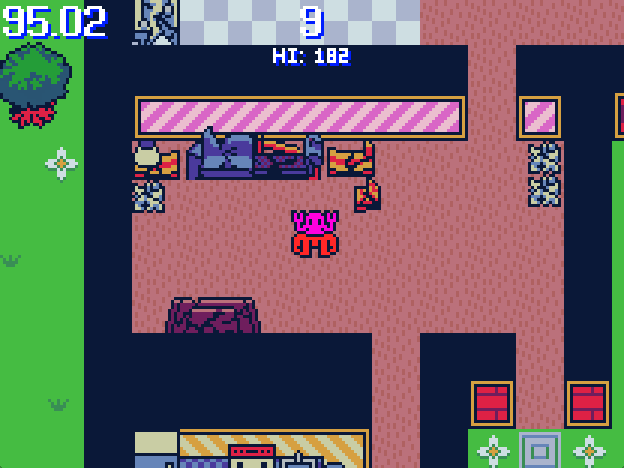 You would mindlessly run over objects, which is fun, but after 60 seconds... you almost await the end. I personally would prefer if the rounds were like 30 seconds long, but you were spawned at a random place in the map. I liked the game in general, I thought everything was placed together perfectly, but I felt it like the gameplay was way too long." I summed up just about every I felt, there, but I want to go over something else I wanted to mention. While I really enjoyed the style and concept of the game... I felt like this was the most un-original thing I've seen you make. There are 2727 other game with the exact same concept. Almost everything this year involved mindlessly destroying things, which is fun, but very un-original. Now, I probably seem harsh-ish right now, but I'm saying this, because I look forward to your unique takes on the theme. Every Ludum Dare, you have something that makes your game "Stand Out", I just didn't feel it this LD. I did feel like the song was a good way of making it a little more special. I really can't complain though because I used the most un-unique gameplay style there is. Good job, and I can't wait to see next LD entry. I'm not talking about the style necessarily. I'm talking about the gameplay itself. You add something unique and different normally, and I think that's what makes you stand out. I had that "you are disabled" game in mind when talking about unique takes on themes. What was unique about Potato The Destroyer?